I made this layout for Sketchy Thursday's latest challenge! I used SEI's Winter Song collection. Do you see that beautiful blue ribbon? It came off of some fun pajamas I got for myself after Christmas! I don't know if I liked the pajamas or the ribbon and cute felt ornament that was wrapped around them. Don't be surprised if you see the felt ornament on a layout soon! Of course, knowing me, I'll hoard it for a while!!! Ha Ha! 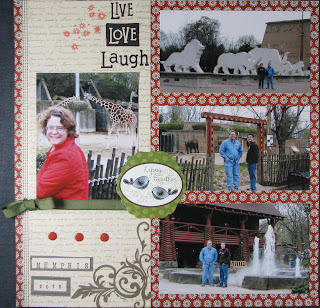 http://kmassman-scrapbooks-cards.blogspot.com/2011/01/have-you-ever-heard-of-csn-stores_31.html and check it out! Be sure to click on the swing set and backyard link!! I'd really appreciate it! I might be able to do a giveaway for them in the future!!!! We cleaned the house (or at least part of it this weekend)! It REALLY, REALLY needed it! 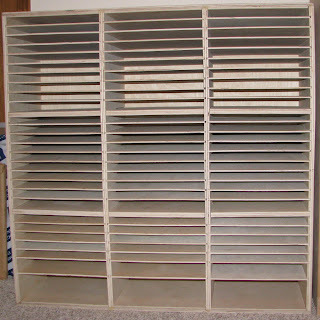 My cleaning mojo killed my crafty mojo, but I wanted to at least participate in one challenge this weekend. So, I made this card! The quote says "Friends fill your life with joy, your soul with sunshine, and your heart with love." You know, all of the textures and varied patterns kind of represent a good friendship-you get the whole mix!!! 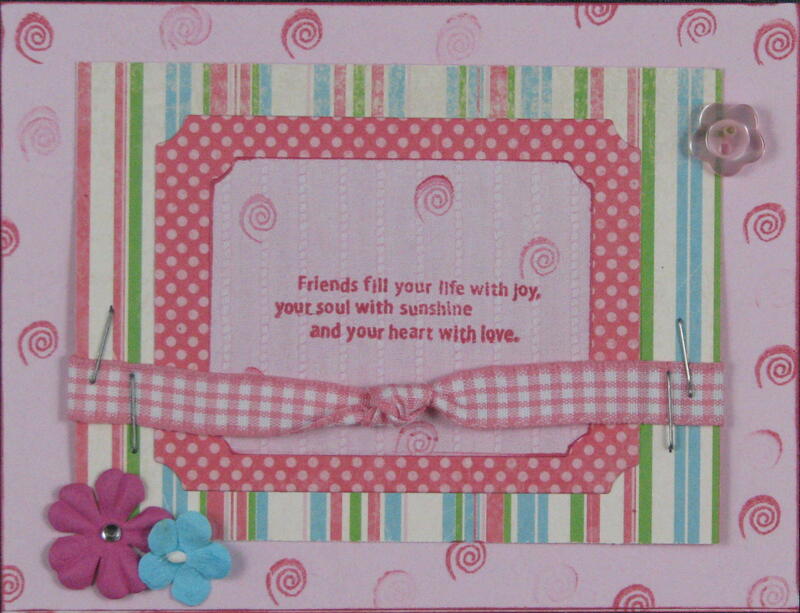 I added staples because sometimes your friends help staple you together during the hard times! It is for the Paper Variety's Friendship Challenge! 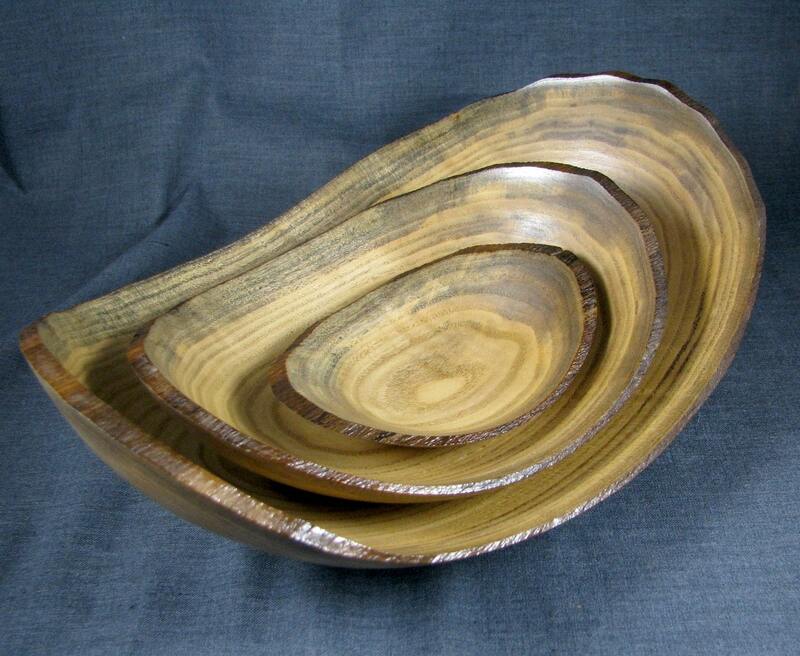 I have to show off some of my husband's latest work! 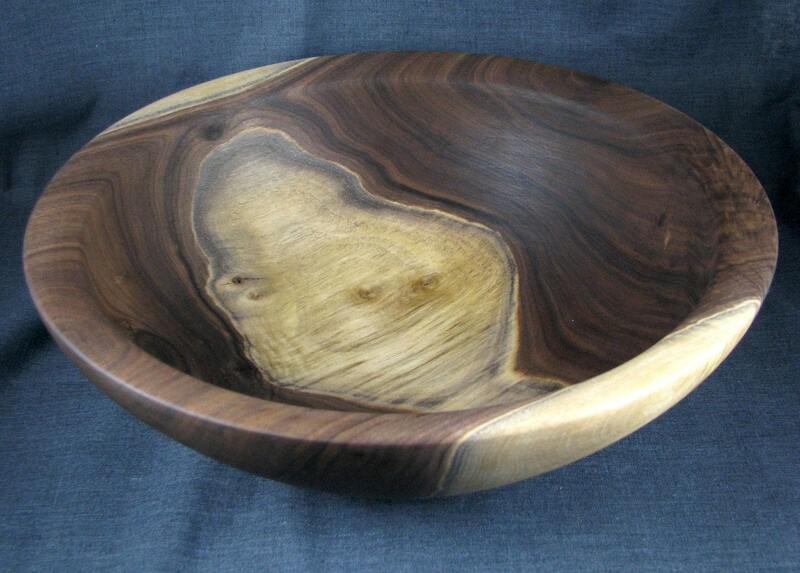 Click on the photo to be taken to the Etsy shop! Edited: These could even be worthy of Martha Stewart??? I thought this photo was so pretty that I immediately thought of some pictures from this past Christmas!!! 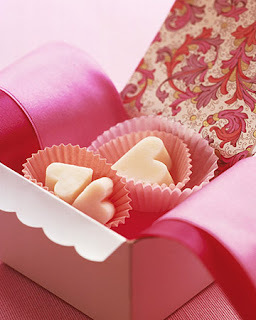 (the little hearts look like the raw cookie dough--and the recipe for the dough I made has some almond extract in it--exquisite) This is the gorgeous Moxie Fab World Tuesday Trigger. Can you tell that my inspiration came from the photo? Earlier, I really tried making Christmas papers work with the photos, but I just couldn't help using all of this PINK--especially after seeing the lovely trigger! I even added an American Craft's medallion/rosette to Basic Grey's Big hot pink and formerly green flower and a button to the smaller one. The papers are American Crafts from the gorgeous Letterbox collection! The tiny letters and words are My Little Shoebox. By the way, this is my son and his friend making Christmas cookies. I made it using Sketch Inspiration #204. I made this My Mind's Eye layout for the latest Sketchy Thursdays challenge! I used My Mind's Eye. The metal charm is from CTHM and the letters are Thickers! 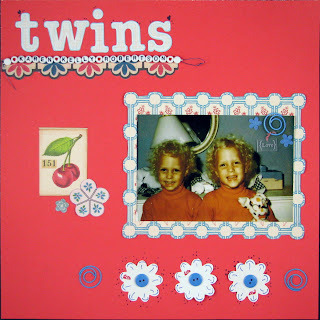 Twins in late 1960s or early 1970s! I made this for the Design Dollies element challenge to doodle!!! This is the 2nd layout that I have doodled on this month. I am not comfortable at all doodling, but I do like this one better than the first one I did. I doodled on the flowers and around the letters on this one--a little more subtle than the first! Anyway, I did it Andrea! I am the twin on the left! I always use Karen's name first, because she was born first! This picture is obviously very old--it's funny how I didn't really notice that we look a little orange in the photos due to the poor quality of the photo after all of these years! 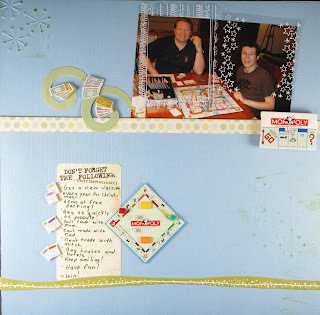 I made this Nikki Sivils layout using The Paper Variety's sketch for this week's challenge! 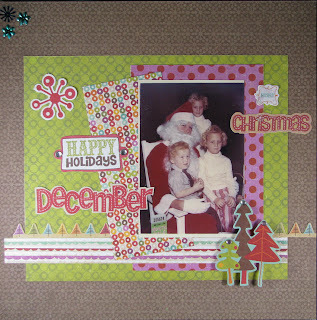 I have to tell you, Nikki's papers make it so easy to do a cute layout in jiffy! I bet this only took 10 minutes tops! (and that includes making the paper medallion flower!!) I used a little My Mind's Eye ribbon and some Basic Grey buttons to finish it up! 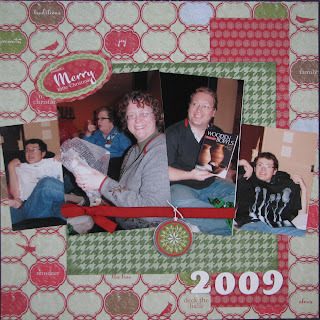 I can't believe I've already made a Christmas 2010 layout when I haven't even finished all of my Christmas 2009 photos!! Oh well... that's me! Hope you are having a great 2011 so far! We are snowed in with about 8 inches of snow! I made this layout of my mom in her kitchen at Thanksgiving in 2010 for Scrapfit's latest challenge. I was so surprised that my mom actually let me take a picture of her. My dad built the kitchen by hand. It's hard to tell, but their counter tops look like little cookies to me. The Lily Bee Design paper couldn't go better with them if they tried! :- For Scrapfit's challenge, we were to use strips on our layout from 2 different manufacturers--mine are from Lily Bee Design and CTMH. I also included a row of embellies as instructed. 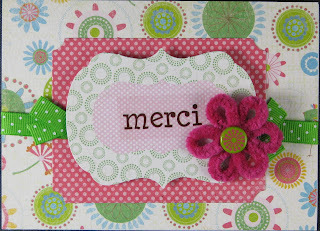 I used a doily, rhinestones, pearls and a flower for Michelle's challenge at Sketches 4 All. My son made this snowman for his Grandma Massman for Christmas last year! I scraplifted Leanne from Artful Delight for Sketches 4 All. I also misted on the paper and included a sequin for Christy's bling challenge. The paper is CTMH. The ribbon is Crate Paper, but it was made to match (it seems)! I made my own shimmery mist and used some punched snowflakes for the masks! I'm entering this into Really Reasonable Ribbon's Challenge #15 is a 'Something New Plus Ribbon' Theme. 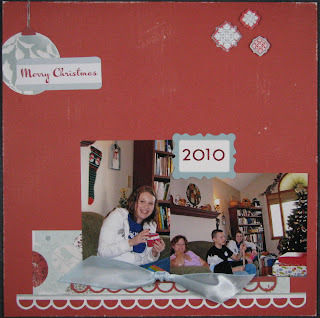 The new is the Crate Paper snowflake which I've made into a brad with Stampin' Up brad maker. Also, the hand-made shimmery is new as well as the Crate Paper ribbon (well, it's new to me anyway)! Thanks for the fun challenge! These are the Massman grandchildren at the 2nd oldest brother's house at Christmas in 2009. 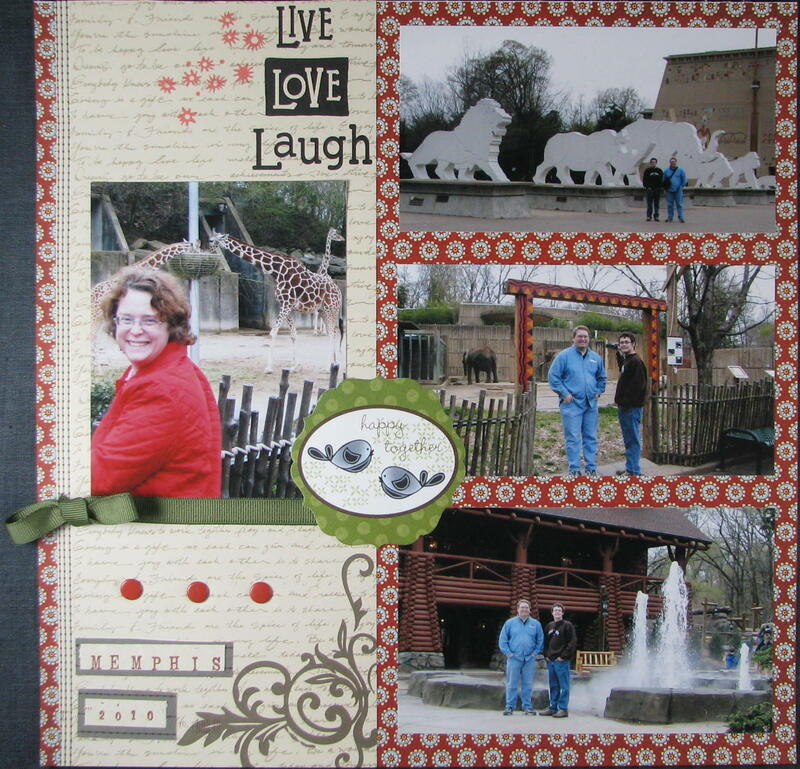 I made this using some metallic papers in bronze, gold and silver for a challenge over at Sketches 4 All based on the Page Map scrapdango sketch contest. 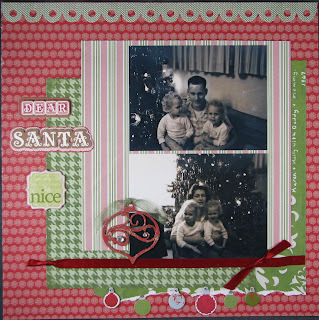 I made this layout for a Bling challenge at Sketches 4 All. This is my twin sister Karen, "little" brother Dennis, and me in the early 1970s. I say "little" because he is now 6' 3". Ha I am the twin who is standing! I used Crate Paper for this. The bling I used is rhinestones on top of the trees and on the Happy Holidays sign, Stickles on the Merry Christmas stickers and some sequins on top! I am most unhappy with this page. Yet, it is finished. 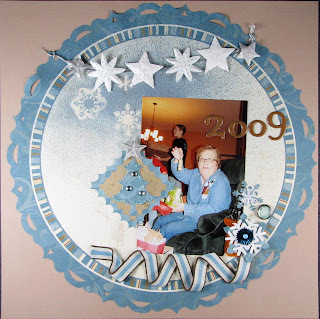 I used colors from the Design Dollies and only used scraps, including making the medallion with scraps, and used mixed alphabet title for Scrapfit's latest challenge. My friend Stacy's idea was to doodle about yourself on a page. I loved the idea, but I just envisioned this a lot better in my mind. I do like the medallion though and the Sassafras and Core'dination papers. I also kind of like using up some of those pesky letters that hang around...I think I woke up on the wrong side of the bed today, too! 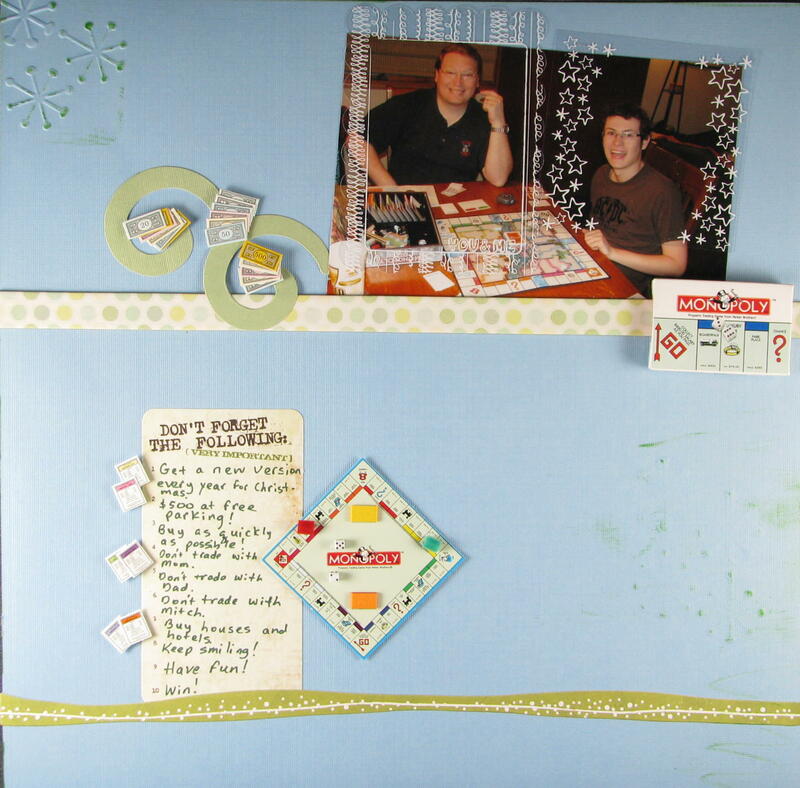 See prizes when you go to Scrapbook Challenges! I made this layout of my Daddy and Mommy holding us twins in 1967 at Christmas! I used My Mind's Eye for the paper and chipboard (except the large ornament, which is Harmonie), the green ribbon is CTMH and the red ribbon came from some Godiva chocolate that I got for Christmas this year! The scallop at the top is from GCD. Each small ornament has a jewel from the I-ROCK--hard to tell from the photo, but it's fun in real life! The large ornament has 3 jewels and some Stickles... I thought it turned out well! This LO qualifies for By the Cute and Girly (bling on ALL of the ornaments plus the paper is very sparkly)! I made this layout from 2009 Christmas based on Sketch #201 from Sketch Inspiration. Steve and I decided at the last minute to buy a ping-pong table converter for our pool table. I had no idea how much fun we would have with it. Mitch was so excited when he realized that there was a ping-pong table downstairs! We played so much through the year 2010. I used American Crafts that I just got from my friend Stacy as well as some Doodlebug letters that she got me earlier. Yes, she supplies my scrapbooking habit quite well. 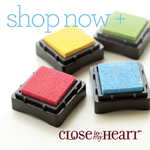 Did you see the cute journaling spots? They are from Shabby Chic Crafts. You can't tell very well in the picture, but the little holly leaves on the Merry Christmas circle are partially cut out so that they are raised a little bit. I thought that was a really cute touch... I also Helmar zap-dotted the labels for a little dimension. That ping-pong paddle and ball sticker is from my stash. I've had it for a long time! I've also had the eyelets for a long time. 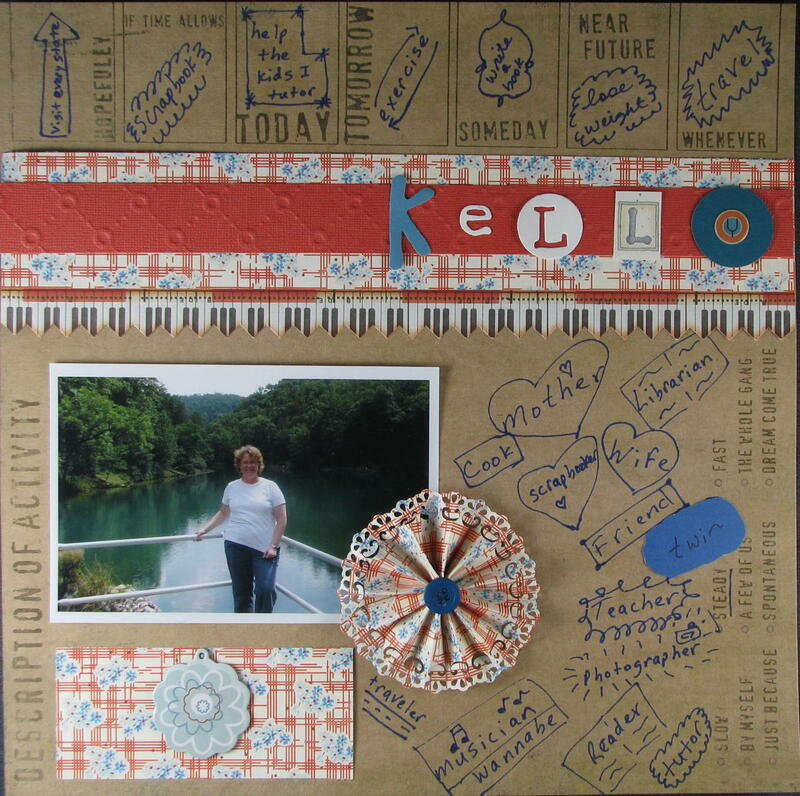 Recently, Sketches 4 All had a thread about using eyelets, so I was inspired to use 4 of them on this layout! 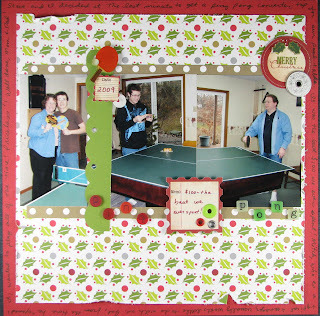 I made this layout based on Artful Delight's monthly sketch! I used Adornit's Misty Collection. I think the papers are so beautiful! 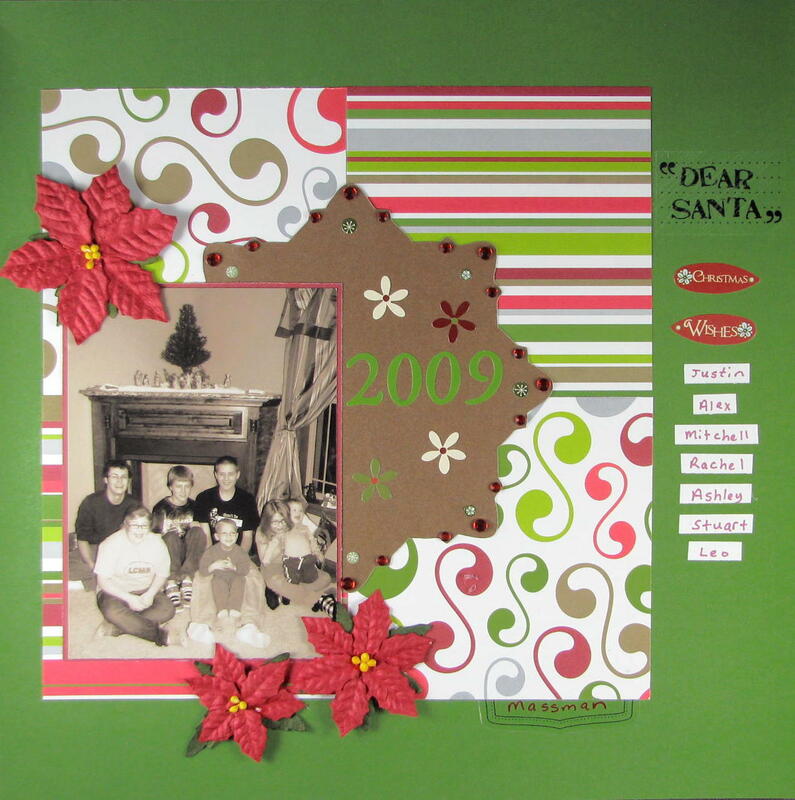 I used CTMH ribbons and snaps. 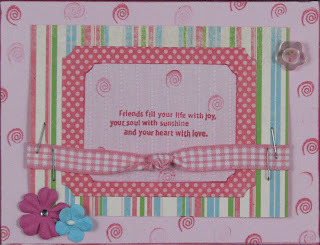 Here's a quick card I made using Old (American Crafts ribbon) and New (MME Whirly Bird and Basic Grey flower)for my friend Stacy's challenge at Sketches 4 All. 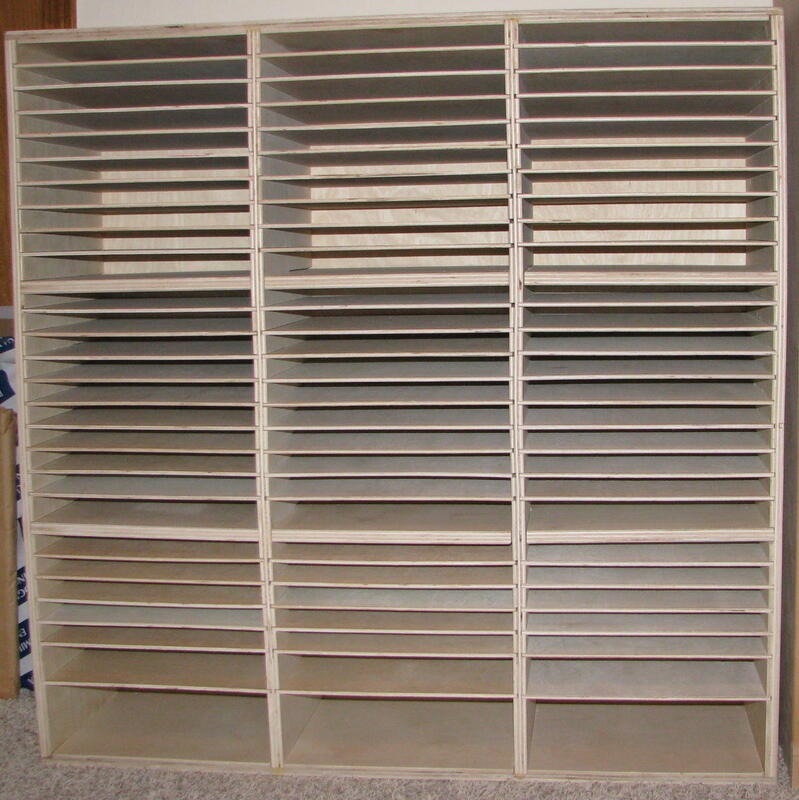 AND HERE are a couple of shots of the new paper shelf my husband made me as a Christmas gift. 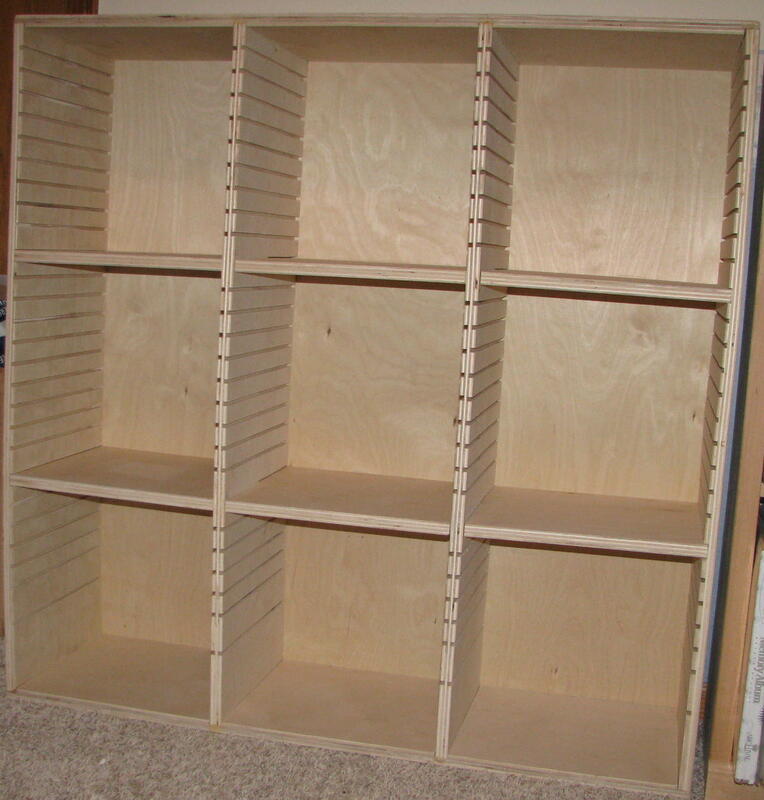 He was sick all last week but toward the end he felt well enough to build this for me!!! Isn't he fantastic!! It has 81 slots I believe. There are some larger ones toward the bottom in case I need them!!!! It looks wonky here because I didn't take the best photo, but wow!!!! What a present!!!!!! 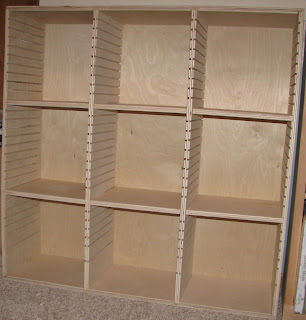 It would have cost quite a bit to buy the mdf shelves which aren't near as nice!!! !